How to Move Contents to iOS 11 from Android iPhone to iPhone X - You can easily transfer data from Android or your old iPhone into iPhone X using new iOS 11 features. Read carefully our tutorial on easily step move from android to ios by transfer contacts, messages, videos, calendar, Emails, photos, etc. During setup iPhone X, you can migrate your content automatically move Android to iOS and securely from your Android device. How to use move to iOS app? On your Android device, ensure that celular data activated prefer use Wi-Fi is turned on stabil connections. Plug your iPhone X or new iOS device and your Android device into power. On your Android device (Galaxy S8, Note8, Nokia 8 or other) open the Move to iOS app and tap Continue. Read the terms and conditions that appear. To continue, tap Agree, then tap Next in the top-right corner of the Find Your Code screen. 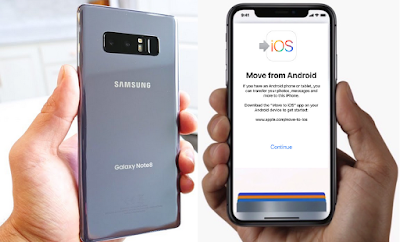 Check on your iPhone X or new iOS device, tap Continue on the screen called Move from Android. Then wait for a ten-digit or six-digit code to appear. If your Android device shows an alert that you have a weak Internet connection, you can ignore the alert. On your Android device, select the content that you want to transfer and tap Next. Then even if your Android indicates that the process is complete, leave both devices alone until the loading bar that appears on your iPhone X finishes. The whole transfer can take a while, depending on how much content you're moving. After the loading bar finishes on your iPhone X, tap Done on your Android device. Then tap Continue on your iOS device and follow the onscreen steps to finish setup for your iOS device. Restart iPhone X and other devices and try again. If Messages doesn't work as expected after you transfer your content, get help from official. You might find that only some content transferred and your iOS device ran out of space, or your iOS device might appear full even though the transfer didn't finish. If so, erase your iOS device and start the transfer again. Make sure that your Android content doesn't exceed the available space on your iOS device. While move your data from Android during setting up iPhone X, on the Apps & Data screen, select Move Data from Android. On the Android device, turn on Wi-Fi, open the Move to iOS app, then follow the steps. Here are some tips for transferring your contacts, photos, music, documents, and more from your Android device to your new iPhone X, iPhone 8 or iPhone 8 Plus. iOS 11 works with email providers like Google, Exchange, Yahoo, and more, so you can probably keep the email, contacts, and calendars that you have now. To get started iOS 11 iPhone X, add each of your email accounts to your iPhone. Then go to Settings > Mail. For each email account, tap the account and turn on Mail, Contacts, and Calendars. Go to the App Store on your iPhone and install Facebook, Twitter, Sina Weibo, Tencent Weibo, or another social media app. Go to Settings and tap the app. Sign in with your account name and password. Turn on Calendars and Contacts. Connect your Android to your computer and find your music. On most devices, you can find these files in Music. On a Mac, install Android File Transfer, open it, then go to Music. To move eBooks from your Android device to iPhoneX, you can either import them to your iOS device or access them through apps like Kindle, Nook, Google Play Books, and others. To access books from an app, go to the App Store, get the app, then sign in with your user name and password. Connect your Android to your computer and find your books and PDFs. On most devices, you can find these files in Documents. On a Mac, install Android File Transfer, open it, then go to Documents. Drag the books and PDFs into your library. On a Mac, go to iBooks > List, and drag your books there. On a PC, go to iTunes > Books. Open iTunes on your computer and sync your ePub books and PDFs. You can find your ePub books and PDFs on your iPhone in iBooks > All Books. Select the documents that you want to move and drag them to a folder on your computer and learn how to use iCloud Drive to keep your documents up to date on all your devices. Most apps that you use on your Android are in the App Store. Go to the App Store, search for the apps that you have now, and install them. Then sign in with your Apple ID and password. Note: You can use the Move to iOS app only when you first set up iPhone X. If you’ve already finished setup and want to use Move to iOS, you must erase your iOS device and start over, or move your data manually. Congratulations, you has learn How to Move Contents to iOS 11 from Android iPhone to iPhone X.